Sue has two Italian cookbooks and one of them had this recipe for Carrots with Marsala. It looked good, and simple to make. Since I had some frozen carrots and also some Marsala I tried it for dinner. The recipe said they would work well with the sweet Marsala as carrots are naturally sweet, I think a sweet Sherry would work also. All of us thought they were very good, I did use frozen carrots rather than the fresh the recipe calls for as I thought they would be less work and I always have some in the freezer. I will certainly make them again as I always am looking for new vegetable recipes as we aren't good about eating them. I am sure the fresh carrots would be good also. 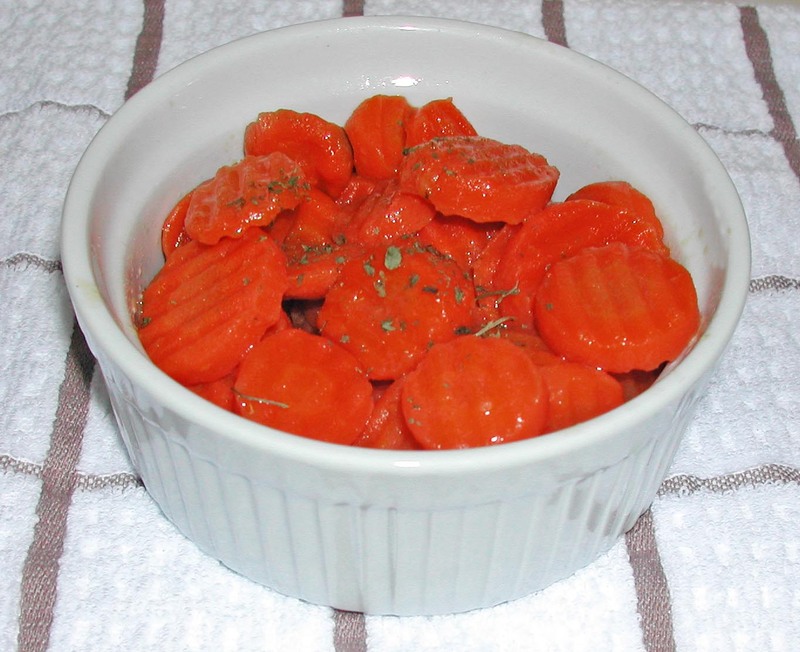 Melt the butter in a medium saucepan and add the thinly sliced carrots. Stir to coat with the melted butter. Add the sugar and salt and mix well. Stir in the Marsala and simmer for 4 to 5 minutes. Pour in enough water to barely cover the carrots/ Cover the pan and cook over moderate heat until the carrots are tender. * Remove the cover and cook until the liquid reduces almost completely. Serve hot. *Mine took about 6 minutes to cook till done. This will vary on how thick your carrot slices are. I like cooked carrots, but the hubby is the picky one. He only eats them raw. Well, I have to say I am with your hubby on that. This is one of the VERY few cooked carrot recipes I will eat willing.